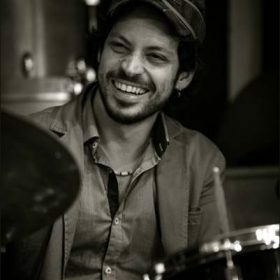 Started out to play drums in a music school in Naples (Italy) where he also had his first experiences in the music scene of his hometown, being a member of different jazz, blues and rock bands. After attending one and a half year of Biotechnology Science at the Federico II University he moved to Rome and he enrolled at Conservatorio Licinio Refice, in Jazz Arranging Degree. In Rome he performed with many musicians from all over the world, in the clubs of the city and in several main festivals in Italy and in Europe (Casa del Jazz, Auditorium Parco della Musica, Villa Celimontana, European Jazz Expo, Sligo Jazz Festival, Actual Festival etc) He also received different scholarships (Elvin Jones Zildjian Award, Most Active Drummer from Berklee Percussion Department, Nuoro Jazz from Paolo Fresu, Roma jazz’s cool) and won some national competitions (St Louis Jazz Contest, Baronissi Jazz, Piacenza Jazz, Ronciglione Jazz). He recently graduated with a full scholarship from the Berklee College of Music in Boston, where he was selected to be part of the honorary program Global Jazz Institute, coordinated by Artistic Director Danilo Perez and with many mentors like Dave Liebman, John Patitucci, Hal Crook, Ben Street, Eddie Gomez, Wayne Shorter, Joe Lovano, George Garzone, Terri Lyne Carrington, Adam Cruz. He performed at Blue Note NY, Birdland Jazz Club, Detroit Jazz Festival, Beantown Jazz Festival, Nancy Jazz Pulsation, Jazz en Comminges, Toronto Jazz Festival, Kimmel Center, Panama Jazz Festival, Kennedy Center in DC, JEN in New Orleans, WGBH, Boston Music Awards, WGBO, Regatta Bar, Sculler Jazz Club, Deer Head Inn, Rockwood Music Hall etc with musicians like Joe Lovano, John Patitucci, George Garzone, Donny McCaslin, Aaron Parks, Rich Perry, Chris Cheek, Julian Lage, Philip Dizack, Dayna Stephens, Gilad Hekselman, Troy Roberts to name a few. He toured all over the States, Latin America, Canada and Europe. In NYC he regularly performs with some of the most talented musicians of the scene such as Christian Li, Mike Bono, Adison Evans, David Neves, Kenji Herbert, Vanisha Gould, Daniel Rotem, Albino Mbie. Giaquinto is co-leader of the internationally acclaimed duo, Radio Intro, with award winning pianist Yakir Arbib and he also composes music for his own project the Roberto Giaquinto Group.